The JRC Capital Management Consultancy & Research GmbH wishes you a happy and successful new year. 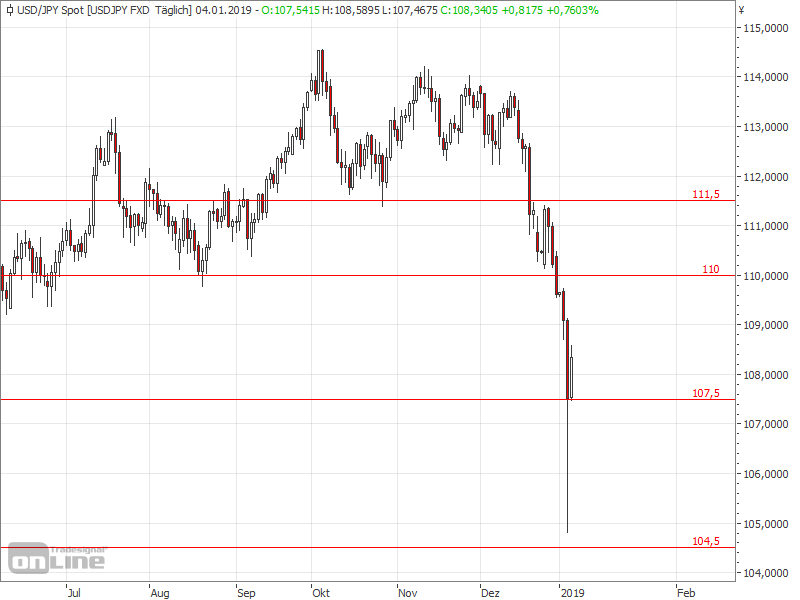 As a starter for this year, we present you the USDJPY. When liquidity is low, markets can move in abrupt ways. Especially, when computer algorithms create trading signals. This is what happened in the night from Wednesday to Thursday, when we saw a flash crash in many currency pairs. In the particular case of the USDJPY, the price dropped by more than 400 pips within a few minutes. However, the USDJPY was able to recover and moves towards its previous level. The nonfarm payrolls were better than expected and contributed to the up move of the USDJPY. Furthermore, they accentuate the positive economy of the US and support the monetary policy of the Fed. In December, the Federal Reserve increased the interest rates by another 25 basis points to 2.25% – 2.50%. For this year, we expect two or three interest rate hikes. The second calendar week is coming with some important economic data, mostly from the United States. On Monday, we expect the trade balance and the ISM – non-manufacturing composite. On Wednesday, the Fed will release the minutes of the latest FOMC meeting, which could contain some important information. The consumer price index will be published on Friday. Already on the days before New Year’s Eve the USDPY fell below the important level of 110 Japanese Yen per US-Dollar. The flash crash caused over 400 pips loss and dropped the USDJPY to its lowest quotation in nine months. Subsequently, the price recovered and is now moving around 108.34. If the USDJPY continues rising, the aforementioned level of 110 could be the first important resistance. At 111.50, we can identify another important resistance for the Greenback. On the down side, important levels are located at 107.50 and 104.50. Especially the latter one is a very important support area. Prices below that level would be the lowest since 2016 and could increase the pressure on the US-dollar.